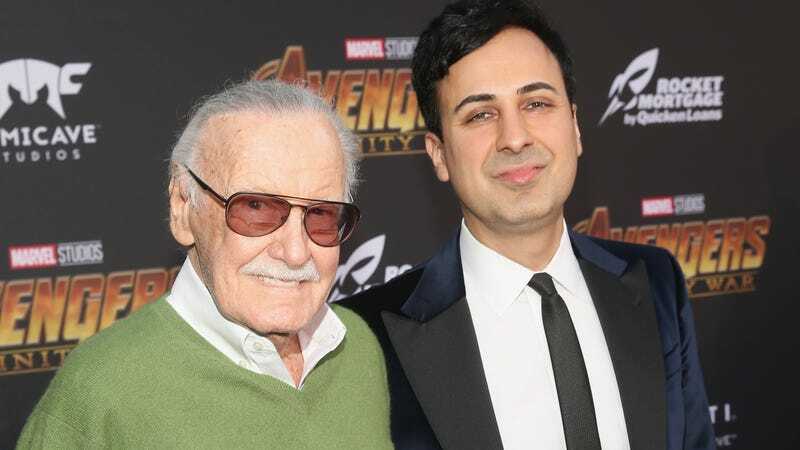 After a bizarre and complicated few months for Stan Lee, it seems like things might be getting back to normal for the legendary comic book creator—in a way that is still pretty bizarre and complicated. That’s because The Hollywood Reporter says he has filed a restraining order against business manager Keya Morgan, a man whose name you might recognize from the way Lee constantly talks about how wonderful and trustworthy he is on social media. Of course, as Bleeding Cool has been quick to point out, some of Lee’s Twitter posts about Morgan are supremely suspicious, like when he tried to assuage concerns about his health with a photo of him and Morgan dancing with John Travolta that turned out to be from 2016 or a photo posted just this month of him with comic artist Ken Bald that was actually from 2013. Morgan was arrested recently on charges of filing a false police report, most likely from an attempted mugging a few weeks that now seems to have been made up, but the Hollywood Reporter doesn’t have any other information on why Lee might’ve wanted this restraining order. This whole mess seems to have started in April, when Lee’s daughter J.C. Lee supposedly began making a concerted effort to take over her father’s finances in the wake of the death of Lee’s wife Joanie—who reportedly had a knack for keeping J.C. in check that her father does not. According to a THR investigation, J.C. Lee was surrounding her father with a number of men who all wanted to get some level of control over his assets. Morgan was one of them, and he quickly fired Lee’s attorney and longtime assistant, changed his phone number, and began reading all of his emails (because of Lee’s “macular degeneration”). Supposedly, pretty much everyone who knows Lee other than his daughter and Keya Morgan recognized that something was wrong, with Kevin Smith offering to let Lee come live at his house in order to escape the various manipulators. Lee later sued former manager Jerardo Olivarez (one of the men supposedly vying for control of his money) and began making repeated statements about how his Twitter page was his only real social media account and that all others are fakes and impersonators. Those are fairly normal things for someone to do in this situation, but they both also played right into the hand of one Keya Morgan, who—as we noted above—is often the star of Stan Lee’s Twitter posts. Getting away from Morgan seems like a good thing for Lee, but according to another Bleeding Cool report, he’s now staying with his daughter and his lawyer—the same daughter who was supposedly trying to gain control of his finances in April. Is it too late for him to move in with Kevin Smith?